I didn't do much game hunting in 2017 but hopefully I can do more this year. to start off with I got a Greatest Hits ver of GranTurismo for PSX, in really good shape for $2 complete. Great game to celebrate the recent 20th birthday of the series. oh yea huh, that makes me feel a bit old though. Good start to 2018. Manage to find Xbox one s cuphead edition at local CL. The guy won the contest from Xbox Twitter give away and decided to sell it so he can get VR gear. Also picked up few games. Not sure why job simulator is rising in price on eBay. Man I haven't been around these parts in years, it's cool to see there's still some find activity! I'm thinkin about compiling a best-of-finds list from the past couple years and posting it. I got away from video games for awhile and they pretty much stopped showing-up in my town, plus I got hooked on vinyl and that's p much why I stopped posting here. I got a lot of great memories for DP and hope it stays around and maybe someday gets some more traffic again. one of....the last game store to carry any thing older than current gen stuff suddenly closed and I managed to pick up a random assortment of things I probably would never buy any way. sadly there was no curren gen or any thing of notable value because everything old $45 and up as well as current stuff was shipped to another store...this was the problem with this store to begin with. I drove by a thrift I used to love visiting that I haven't been in for some time, and I decided to stop. Good thing, too. Thrift stores are usually so bare it's not worth the effort, but this time I got lucky. 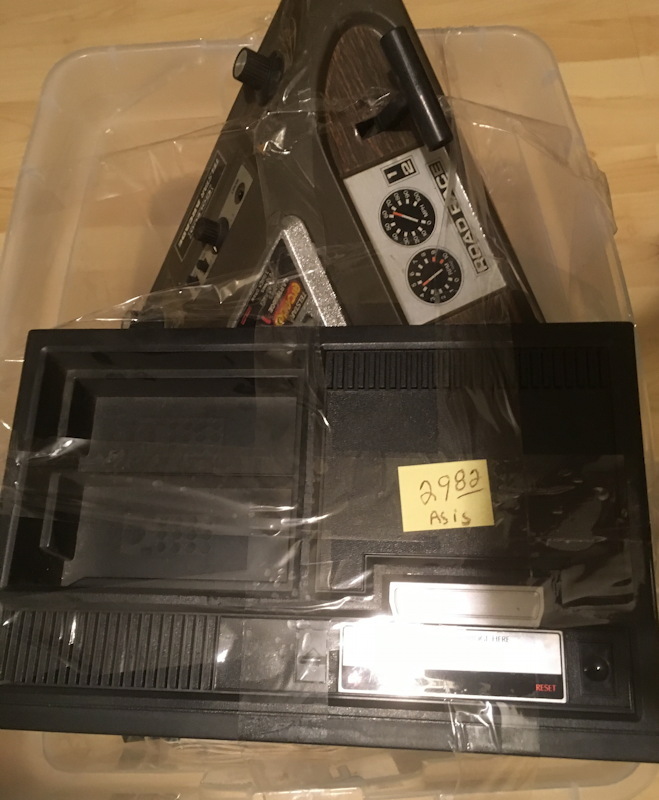 Came across a plastic tub covered in cellophane tape with what I noticed was a bare Colecovision on top. Underneath... is that really a Coleco Telstar Arcade? I always wanted one back in the day, so I grabbed it. $29.82 for the whole tub, "as-is". I purposely didn't look too hard into the box because I kind of wanted it to be a surprise for when I got home and opened it. 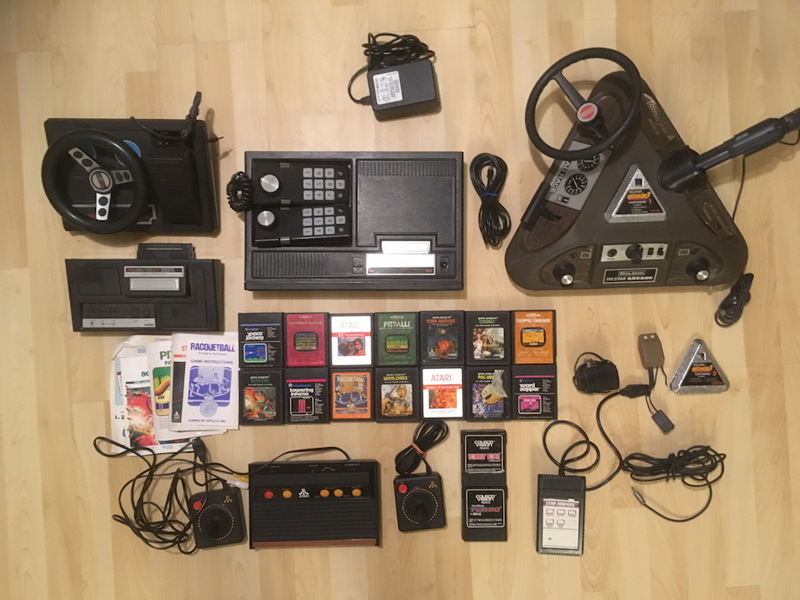 That bare Colecovision had the controllers underneath, along with the Atari 2600 Changer and Driving Controller module. The steering wheel and pistol missing from that Telstar Arcade were wrapped in a bag underneath too, along with cartridge #3 (kind of damaged, I have no idea if it'll work right). There was an Atari Flashback 2 underneath without a power supply. Other than that, everything else has cables and power supplies. There were only common games included unfortunately, but that Telstar Arcade makes up for that. I'm definitely happy. Awesome find. It's probably been more than 10 years since I've come across anything remotely like that in a thrift store. I remember quite often finding comforter bags wrapped in packaging tape stuffed with game system stuff for around $30. That doesn't keep me from checking thrift stores on a weekly basis though. After giving it a good look over, I realized that the Coleco Telstar Arcade power supply (a) has what looks like a worn-out cord coming off the wall wart, which is not a big deal since (b) the tip that plugs into the console is missing, there's just two loose wires. And the Telstar Arcade doesn't run off batteries. Guess I need to find a replacement. I got a tub of black wii at a flea market for $10, its turns on, no disc inside, controller was chewed on my an animal of some sort but hey, it was $10 and gamecube compatible. Picked these up for cheap. Ps3 hori steering wheel for $0.99 and dark soul 3 collector edition for $4.99. Dude, good job on buying that PS3 Hori steering wheel! I picked up Outlaws for PC yesterday. A game from LucasArts I'd never heard of, so I picked it up for a couple bucks. Pretty meh as far as finds go, but it has been so long since I found anything at all, it was worth a post. Cool. I played through that back in the day. It was very unique for its time. all came from a shoebox on the floor at a salvation army! Holy schnikies, mailman187666! That's a really good price for those! Yeah, I've heard that the capacitors die on Game Gears quite often. Capacitors are more likely to make the screen dark and I think cause sound issues. Since it does turn on, try cleaning the cartridges and connector really good with isopropyl alcohol and see if that helps. But yeah, either way, there's a good chance it needs new caps. I stopped at a GameXchange in Shreveport, LA and found a few boxed and possibly factory sealed Japanese Virtual Boy games - the one here was only $12.95. I don't know if it's been sealed after the fact, there's a big gap in the plastic wrap on the back side which makes me think it's been re-sealed. And I bought the Super Famicom F1 game for $4.95 at a place called 2nd & Charles. 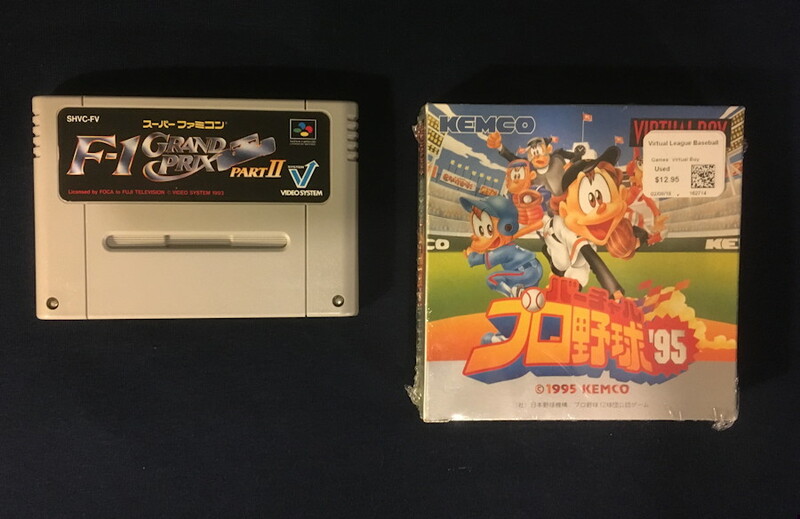 That GameXchange had a bunch of loose carts, too. Including Waterworld for $115. The salesperson told me they also got in Jack Bros. for something like $250 and sold it really quickly. 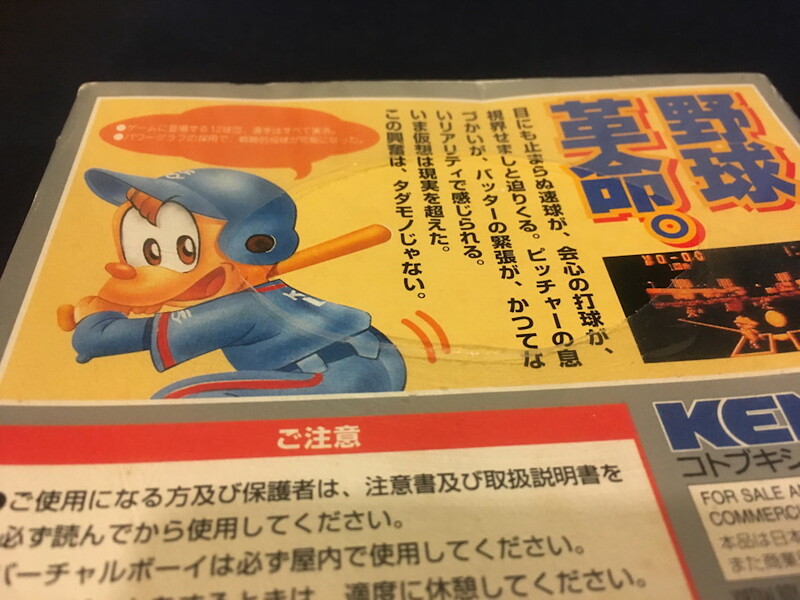 Games sold in cardboard boxes in Japan were almost never sealed in plastic. Somebody definitely sealed it later on. Yeah, I kind of assumed as much. The shrink wrapping isn't really the kind you get on new game boxes, it doesn't seem factory quality. Thanks! This would have been a weekly type of find a few years ago but since I actually haven't found much of anything lately, I'll post this. I went to a Goodwill today that charges $1 per pound so this stuff cost practically nothing. I also found an Arduino with a few odds and ends that go with it, a webcam, component video cables, night vision goggles(ok, they're basically a toy but they actually work so whatever), and a few other things that I don't remember.